Background: The 2017 Australian Digital Health Agency National Digital Health Strategy (ADHA Strategy) is based on the underlying assumption that digital technology in healthcare environments is ubiquitous. 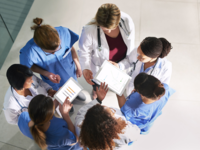 The ADHA Strategy views health professionals, especially nurses, as grappling with the complexity of installing and using digital technologies to facilitate personalized and sustainable person-centered care. Yet ironically the 2018 debate over how to enrol Australians into the national electronic health record and its alteration from an opt-in to opt-out model heightened public and professional concern over what constituted a ‘safe, seamless and secure’ health information system. What can be termed a ‘digital technology paradox’ has emerged where, although it is widely acknowledged there are benefits from deploying and using digital technology in the workplace, the perception of risk renders it unavailable or inaccessible at point of care. The inability of nurses to legitimately access and use mobile technology is impeding the diffusion of digital technology in Australian healthcare environments and undermining the 2017 ADHA Strategy. Objective: This study explored the nature and scope of usability of mobile technology at point of care, in order to understand how current governance structures impacted on access and use of digital technology from an organization perspective. Methods: Individual semi-structured interviews were conducted with representatives from professional nursing organizations. Ten interview questions focused on factors that impacted the use of mobile technology for learning at point of care. Seven national organizations and 52 Coalition of National Nursing and Midwifery Organizations members were invited to participate. Interviews were recorded and transcribed verbatim. Data analysis was systematic and organized, consisting of trial coding, and member checking was undertaken to ensure rigour. A codebook was developed to provide a framework for analysis to identify the key themes latent in the transcibed data. Nurses as stakeholders emerged as a key theme. Results: Four female and two male senior members of ther nursing profession were interviewed. Each interview lasted between 17 and 54 minutes which related to knowledge of the particiant regarding the topic of interest and their availability. Two sub-themes coded as ‘ways of thinking’ and ‘ways of acting’ emerged from the open codes. Participants provided examples of the factors that impacted the capacity of nurses to adopt digital technology from an emic perspective. There were contributing factors that related to actions including workarounds; attentiveness; and experiences. Nurses also indicated there were attitudes and influences that impacted thinking regarding access and use of mobile technology at point of care. Conclusions: Nurse are inadequately prepared for the digital future that has now arrived in healthcare environments. Nurses do not perceive they are leaders in decision making regarding digital technology adoption, nor are they able to facilitate digital literacy or model digital professionalism. The journal is now open for submissions. JN is a "platinum open access" journal, with no charges for readers or authors. Background: In the second half of 2014, the first case of Ebola virus disease (EVD) was diagnosed in the United States. During this time period, we were collecting data for the Measuring Network Stability and Fit (NetFIT) longitudinal study, which used social network analysis (SNA) to study relationships between nursing staff communication patterns and patient outcomes. One of the data collection sites was a few blocks away from where the initial EVD diagnosis was made. The EVD public health emergency during the NetFIT data collection time period resulted in the occurrence of a natural experiment. Objective: The objectives of the NetFIT study were to examine the structure of nursing unit decision-making and information-sharing networks, identify a parsimonious set of network metrics that can be used to measure the longitudinal stability of these networks, examine the relationship between the contextual features of a unit and network metrics, and identify relationships between key network measures and nursing-sensitive patient-safety and quality outcomes. This paper reports on unit communication and outcome changes that occurred during the EVD natural disaster time period on the 10 hospital units that had data collected before, during, and after the crisis period. Methods: For the NetFIT study, data were collected from nursing staff working on 25 patient care units, in three hospitals, and at four data collection points over a 7-month period: Baseline, Month 1, Month 4, and Month 7. Data collection was staggered by hospital and unit. To evaluate the influence of this public health emergency on nursing unit outcomes and communication characteristics, this paper focuses on a subsample of 10 units from two hospitals where data were collected before, during, and after the EVD crisis period. No data were collected from Hospital B during the crisis period. Network data from individual staff were aggregated to the nursing unit level to create 24-hour networks and three unit-level safety outcome measures—fall rate, medication errors, and hospital-acquired pressure ulcers—were collected. Results: This analysis includes 40 data collection points and 608 staff members who completed questionnaires. Participants (N=608) included registered nurses (431, 70.9%), licensed vocational nurses (3, 0.5%), patient care technicians (133, 21.9%), unit clerks (28, 4.6%), and monitor watchers (13, 2.1%). Changes in SNA metrics associated with communication (ie, average distance, diffusion, and density) were noted in units that had changes in patient safety outcome measures. Conclusions: Units in the hospital site in the same city as the EVD case exhibited multiple changes in patient outcomes, network communication metrics, and response rates. Future research using SNA to examine the influence of public health emergencies on hospital communication networks and relationships to patient outcomes is warranted.